F.S. Sweet Loves Dr. Seuss! F.K. Sweet staff and students were so very excited to wear our favorite hats to honor Dr. Seuss’ book, The Cat in the Hat. Such a fun-filled week of dressing up and learning all about Dr. Seuss and his fabulous books! Featured in the photo: F.K. Sweet Kindergarten teachers along with our Principal, Mrs. Jackson. Mrs. Perez accepted a Certificate of Appreciation from the Council on behalf of the school. Congratulations, Palm Pointe! 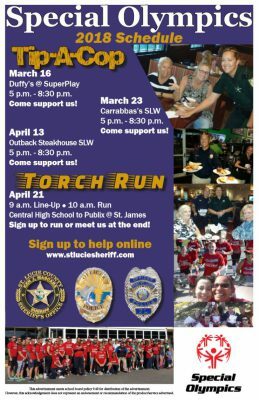 There are many opportunities over the coming weeks to support Special Olympics culminating in a Torch Run on Saturday, April 21st from Fort Pierce Central High School to Publix at St. James. Don’t miss out! Join with family and friends for one or more of these family friendly events.